Director Simon Stone explains how the set design for his new production—now in previews in New York—is crucial to how a story of madness is told. 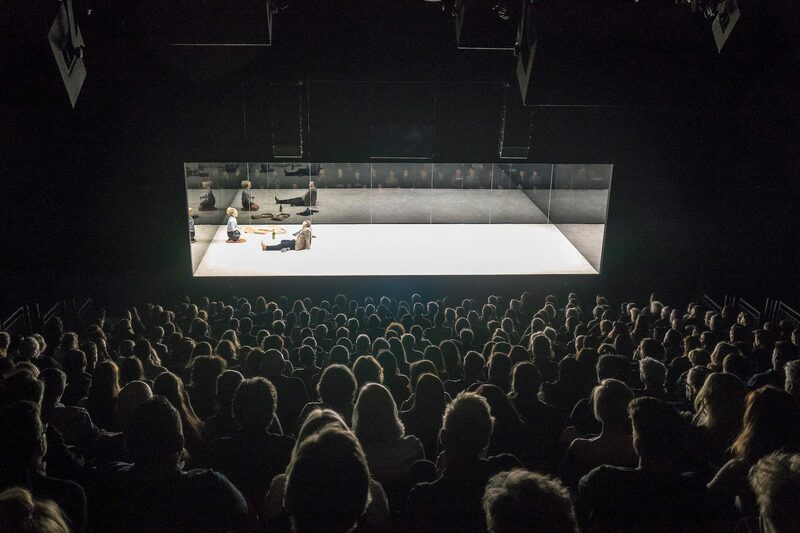 Earlier this month, two glass boxes took shape on New York’s Upper East Side, becoming the deceptively simple set for director Simon Stone’s “Yerma” at the Park Avenue Armory. An import from London’s Young Vic theater, which showed last summer there to rave reviews, the production is Stone’s contemporary interpretation of Spanish poet Federico García Lorca’s 1934 play about a woman driven mad by her inability to conceive. The setting, ingeniously brought to life by designer Lizzie Clachan, holds the action much as a petri dish would—as a confining, sterile stage for observing the behavior of unpredictable contents—and serves an essential role in the story’s telling. “I always like the audience to reflect on the act of entering a theater,” Stone says of his idea for the design. “It’s one of the big questions I think we have to answer as theater artists nowadays: Why should people go to the theater at all anymore? There are so many less time-, money- or effort-consuming ways to access narratives and entertainment. What is it that congregating in this ancient space brings to contemporary audiences?” With Yerma, he gives us an answer. Here, the director tells us how the set design came to be. [For Yerma’s staging,] I wanted to engage in an almost scientific dissection of a modern woman’s descent into personal tragedy. We watch her as if she’s under a microscope or inside a terrarium. We collect the facts, observe the specimen. So I wanted to put the audience on two sides of a rectangular space, framed by two parallel glass walls. The set changes would be achieved invisibly and mysteriously. The basic change would be that in a split second an entire room could change—from apartment, to garden, from one season to another, to a barren field in the rain—all within an impossibly short moment that felt like a cut in the cinema. In a theater, where there’s seemingly no backstage because the stage is surrounded by audience, how on earth can you change the décor so fast? It’s the basis of magic: show the audience how impossible an idea is, then do it right in front of their eyes. I went to Lizzie [Clachan, the set designer] with this idea—audience on both sides, glass walls, four distinct environments, impossibly quick changes between them—and didn’t expect her to be able to pull it off. But she’s a magician. She worked with Igor, the production manager, and threw her entire ingenuity at the problem. It was a case of trial and error. Working with the dimensions of the very flexible but small Young Vic space, Lizzie eventually found exactly enough room in the dock of the theater to duplicate the set. She developed a system with one hydraulic floor moving up and down and one floor sliding in and out of the dock, and I wrote scenes in a very particular order that could mean that we could replace the offstage floor while the other one was being played on. There’s a moment where within thirty seconds an entirely functioning apartment with living room, dining room, and kitchen with working taps appears after the space was completely empty, and goes back even quicker to the same void. The system relies on all of the stagehands wearing night-vision goggles and removing the props, guiding the actors on and off (because they can’t see a thing), essentially resetting everything in a complete blackout. It’s an idea that was very ambitious from the outset but only ever worked because every single person was completely invested—and almost killed themselves to pull it off. This deconstruction can take the magic out of it somewhat, but the ultimate aim of the idea was to create a documentary atmosphere in a theatrical setting. Theater is the realest of all art forms—it’s actually happening right there in front of you for the first and last time in that particular way on that night that you’re watching it. And yet it can often feel so, well, staged, with all the artificiality that entails. The magic of theater is in its presence, its spontaneity, in its role as a crucible for the most human and revealing performances. I wanted to remind an audience that we come to a space with other members of our society: The first thing we see is a reflection of ourselves in the glass wall. I wanted us to lose ourselves in the magic of someone else’s existence, not because we’re looking at pretty costumes or exquisite period décor, but because we’re witnessing someone just like us becoming a figure from the classical theater tradition, through seemingly impossible compressions of space and time. All the tricks we used were just a vessel for that. And at the end of the day, it’s all just a scaffold you build around the actors: You do what you can to help them get on stage and be able to let go, to become truly vulnerable and share their souls with us. Thank God we had Billie Piper and her marvelous ensemble.